One of the latest reports we created using the great new Custom Reporting tool in QuickBooks® Enterprise 2011 was a Cash Register Receipt Report that a client requested. This report allows the client to enter a specific date and see the checks that were received for that day, what invoices they paid off, and then what account those checks got deposited into. We have this report grouped by deposit account number and then by the check number. 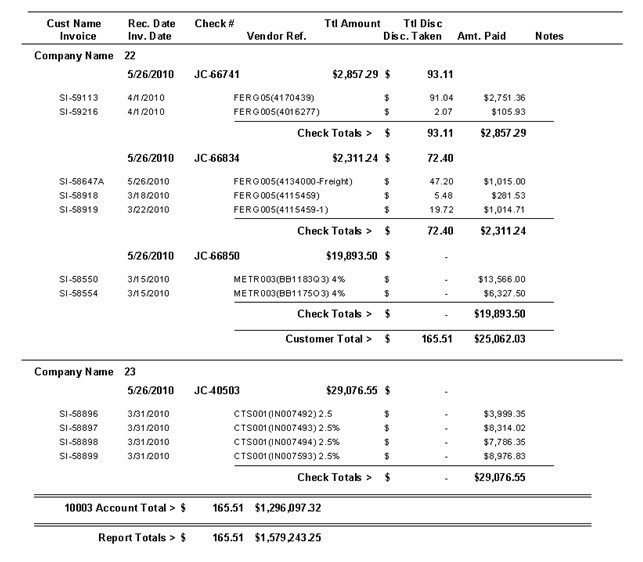 The report displays the check number, date, and customer along with the payment total and total amount of discounts given for the invoices covered by that check. Additional invoice details from the check such as date, memo, amount paid, discount amount, etc. are displayed as well. This report will help the client with daily reconciliation of their finances, something very important to their business. If you have a need to have all this type of info all in one place please feel free to contact us. We will be happy to customize this report to make it fit the specific needs of your company, or use this as a starting place to create a whole new report for you. Please note that this report was created using the QuickBooks® Enterprise 2011 Custom Reporting Tool and Crystal Reports XI. Email us at quickbooks@acsi-az.com or call us at 620.454.9222 to discuss your custom reporting needs. We were going over a few issues that we had identified in QuickBooks® Enterprise with one of our clients. During the 2 hour meeting one of the salesmen asked why a certain Sales Order was still showing as open. Our first response was, “Because it’s not closed,” which we quickly followed up with, “Don’t know, let’s have a look.” When we opened the Sales Order he got a rather puzzled look on his face when he noticed that the freight charge had not been invoiced. So, in an effort to track things down we went and found the associated Invoice. The freight charge was there, and he now had an even more confused look on his face. Luckily the controller was in the room and spoke up, “Oh, I corrected it.” By that he meant that he had added the freight charge to the Invoice and sent it on its way. However, that did not take care of the open line item on the Sales Order. So, we went in and check the “Clsd” column for the freight charge. I came across a client who was having trouble printing a packing list, in QuickBooks® Enterprise 2010, that displayed only one of the items on an invoice. Here was there question followed by our answer. Q: I have a Sales Order that has three items on it. Two of the items are being drop shipped from two separate vendors and the third item is coming out of our inventory. I have created an Estimate with all three items on it. I then created the required Purchase Orders from that Estimate, followed by a Sales Order. When I was ready to Invoice the customer I wanted to print a Packing Slip that contained only the one item coming out of our stock, however it shows all three Items. How can I print a Packing Slip with only the one Item, but still include all three on the Invoice? A: While there may be more than one way to skin this cat this is how we handle the situation. Do everything the way you are up until it comes time to create the Invoice. From the Sales Order click on the Create Invoice button and when prompted to create and Invoice of all Items or selected Items, chose selected Items and enter a quantity for the Item you want to appear on the Packing List and change the other Items to 0 (zero), click Okay. Note that all the Items appear on the Invoice, but only the one Item has a quantity in the Invoiced column, the Item you want to print a Packing List for. Go to Print and print your Packing List, only the one Item will be visible. After you have successfully printed the Packing List go into the Invoice and change the value in the Invoiced column to the total number you intend to Invoice for, Save and Close.